This documentation is for BotBox Personal Assistant 1.2 and describes how to use BotBox information monitoring agents on the Windows platform (9x/ME/NT/2000/XP). 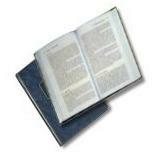 For comparison of different product types see our products page. Download the new version of BotBox Personal Assistant Standard. Install by running the downloaded installation program pa12.exe. When installation is complete, start BotBox by selecting it in the "Start/Programs" menu or by clicking on the BotBox icon on the desktop. The news viewer show you the latest news that has been found. Just click on a headline and you will browse to the news article. The first time BotBox Personal Assistant is started, you will be asked to select a news profile. When you have selected the profile of your taste, a news window will open and BotBox Personal Assistant will start to bring you the latest news (news will show up in a few seconds). A news item is visited in the web browser by clicking on a headline with the left mouse button. Commands are given either via the toolbar at the bottom of the news window (see screenshot to the right) or via right mouse button pop-up menus. The "BotBox" button gives you access to a pop-up menu from which you can open and create profiles, mark/remove headlines, etc. Profile Settings: The window is split into available news sources (top half) and monitored news sources (bottom half). Available news sources are organized per provider: BotBox.com (Sources and Advanced Services) and Moreover.com. Clicking on a provider displays its available categories and news sources. The monitored news sources are currently being monitored for new headlines by your Personal Assistant. To monitor a news source, select provider and category, then press the "Add" button (to the left of each source). The news source will appear on the list of monitored news sources. When you add advanced services (see below), further information must be given, depending on the type of source. To stop monitoring a news source, select it in the list of monitored sources and press the "Remove" button. You can also see latest information below the "status" field. There you will when the last news scan happened, and how many new headlines was found. If something goes wrong, there will be an error message here. In BotBox Personal Assistant 1.2 Standard there are a number of advanced sources and services. There are for example information monitor agents that periodically scan search engines based on search queries given by you. 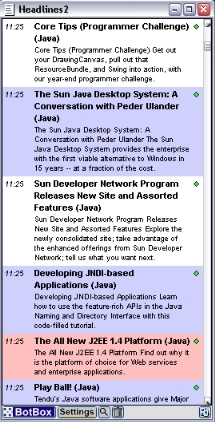 The two generic information monitors, "Page Update Monitor" and "New Link Monitor", can be used to monitor any web page for updates. They need extra information such as a web page address, and will request the required information when added to your profile. An addition to version 1.2 is support for RSS based sources which have become very popular for many news sites and webblogs. The Source Creation Wizard makes monitor configuration an easy task. 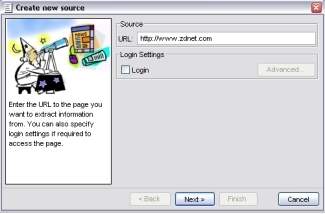 All these monitor agents are available from the "Adv Services" provider and can be added and configured from there, but if you are going to monitor a generic web page it is much easier to use the Source Creation Wizard (see image to the left) by clicking on "Create Source..." in profile setting. Copyright © 2001-2005 BotBox AB. All Rights Reserved.